New SCPA cranes will be located at the Wando Welch Terminal. New SCPA cranes provide 155 feet of lift height from the dock. SCPA's Wando Welch Terminal is undergoing $44 million upgrade. The delivery of two super postpanamax cranes at South Carolina Ports Authority (SCPA) last Friday marked a significant milestone in the port’s big ship readiness. Also in the works in the same vein are projects to complete the Wando Welch terminal wharf and the deepening of the harbor to 52 feet. SCPA is already seeing the upsizing of vessels in response to the Panama Canal expansion, and expects to handle its first 14,000-TEU vessel call later this year. Charleston offers the deepest harbor in the southeast, and upon completion of its deepening project to 52 feet, Charleston will be the deepest harbor on the East Coast. 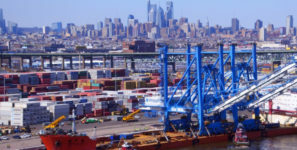 Beyond harbor deepening, SCPA has a 10-year, $1.3 billion capital expenditure plan that includes the construction of a new container terminal, the Leatherman Terminal, and the modernization of existing facilities and technology. SCPA’s extensive investments ensure the port will be competitive in the future, continuing to provide $53 billion in annual statewide economic impact and securing region’s role in economic development and global trade.